The results are in for the Nintendomax DS Dev Compétition 2010. In the end there where a total of thirteen entries and two of them where mine. My game Multi View came in fourth place and my other game Dont Get Crushed came in tenth. I’ll admit that I was hoping that one of them might make it into the top three. If I had gotten some music or sound effects into it maybe Multi View would have made it… But I’m happy with the results. Fourth place isn’t bad considering that I never fully completed the game and was totally new to developing for the platform when I made it. It was fun competing and learning how to code homebrew for DS. I would just like to applaud all of the other competitors on the great quality of their submissions and congratulate Sverx, Smealum and Relminator for winning. I’m looking forward to participating in any competitions that Nintendomax has in the future. Its getting REALLY close to the deadline. Here is one final update to Multi View. I added a title/menu screen. There are now three levels to choose from (one of which is randomly generated). You can press start at any time t return the the menu. I improved the collision system. I added touch screen controls for turning (although the game is still intended to be played primarily with the directional pad and the A button). Did some other little stuff but I think that’s everything notable. The above screen shot is of the game running in an emulator. On an actual DS there is fog and an anti aliasing effect. Its my understanding that its alright to submit more then one game for the competition so here is my second entry for the Nintendomax DS 2010 Competition. Its not yet complete and my own procrastination has slowed ts progress but I’m still hopeful that I will be able to finish it in time. There is only a week left before the deadline. 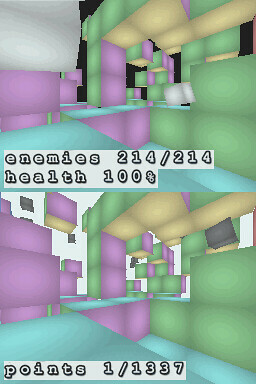 Multi View is a 3D first person platformer. Both screens are used to display the same game world but the white cubes that you must avoid are only visible on the top screen and the black cubes that you must collect are only visible on the bottom screen. This means that you need to pay attention to both screens simultaneously as you play. Use the directional pad to move and the A button to jump. I would love some feedback so let me know what you think of it.